Metro is currently fishing for a contractor to rate all the street-level crossings on the Blue Line, the popular DTLA to downtown Long Beach light rail line. An early plan calls for elevating or sinking the train at busy intersections; the ones where the most car vs. train and train vs. pedestrian accidents occurred. Another proposal could turn the ground-level Wardlow Station in Long Beach into an elevated stop, ala the Chinatown or Culver City stops. Now armed with billions of dollars after the passage of Measure M, Metro could begin considering upgrades to various lines, in addition to building new ones. The aforementioned Blue Line already received $1.4 billion in improvements, including new pedestrian gates to cut down on the line’s abysmal safety record. But the Blue Line is far from the only Metro line that shares space with cars, bikes, and pedestrians. Many have been clamoring for grade separation for the Expo Line, which shares tracks with the Blue Line in DTLA. Trains sometimes slow to a crawl and frustratingly stop when they hit red lights along Flower Street (watching cars zooming by while you’re standing on a motionless train is a sick Los Angeles irony). For years, transit activists have called for this section of the Blue and Expo lines to be moved underground, as well as the at-grade Pico Station, which is now surrounded by high-rise construction. The Pico stop—which requires people step over train tracks to enter and exit the station—will only get more busy when the Regional Connector opens in a few years. That project will mean even more people navigating this very complicated area, with trains zipping by every couple minutes. The increasing frequency of trains is, most importantly, a safety concern. But it’s also a traffic issue. 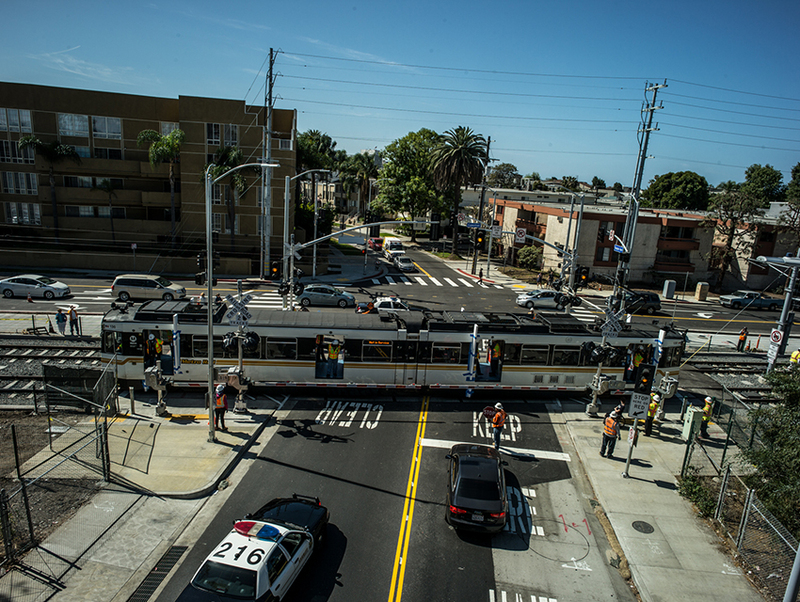 With Expo Line trains now arriving every six minutes during rush hour, crossings that are not grade-separated have been bedeviled by congestion. On the Westside, Overland and Barrington avenues are slammed with idling cars in the afternoon, with traffic backing up to Pico and Olympic boulevards; Bagley Avenue in Palms is also a concern. During rush hour, these crossings often feel dangerous and tense. Metro should definitely consider bridges for one or two of these crossings, as well as elevating the Farmdale station in West Adams, which the public wanted when the line was being designed. While the Green, Red, and Purple lines are fully grade separated, the Gold Line also mixes with street traffic in several areas, most noticeably in northeast L.A., and East Los Angeles. While the Gold Line’s safety record is much better than the Blue’s, commuters complain about slow speeds around Lincoln Heights, Mount Washington, and Highland Park. Ridership on this line got a slight bump when the Foothill Extension opened in the spring, but Metro is going to have to keep innovating to make sure Angelenos see these trains as viable options to Uber and the various other ways to get around the city.